Austrian mountain man made from pinecones. He is wearing an Alpine hat made with felt, and has a long, furry beard. Fur on body and face. His face is created by gluing eyes and nose made from felt unto the pinecone face. His vest and pants are also cut from felt. His coat is fur (probably rabbit). 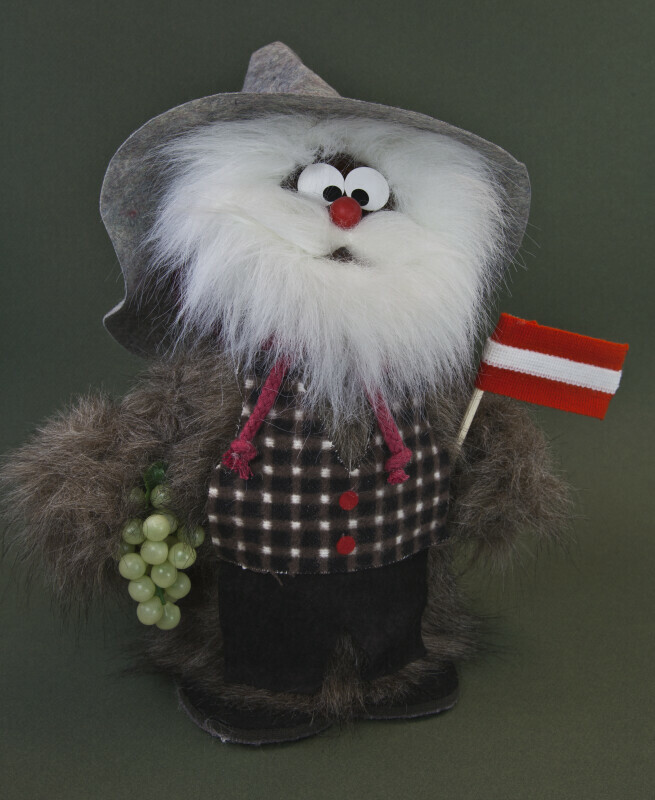 He is holding plastic grapes and an Austrian flag. Tag (roughly translated from German): "Hand Made in Austria. You have just decided for a carefully processed Naturprodukt-Souvenir. We congratulate! To this end, we have products from the immediate vicinity of the producer in loving Handarbeit in a small family-run business. The idea was born of Waldviertler say, 'he Good, Italians affected by woodland spirit' may the Spirit in the shape of the product grant you good luck and joy remaining! Sincerely yours Trautsamsieser KET." The figure stands 12 inches (30 cm) tall.